We all love crystals, right? We all work with them in a variety of ways: in ritual, as jewellery, decoration in our homes, and in many other ways. And most of us are familiar with the "stock standard crystals" that most people tell you are in their top 5 or 10 crystals. Rose quartz, amethyst, clear quartz, fluorite, and so on. But there are a few crystals that people don't mention that I find are incredible to work with. I have put together a free ecourse for you to learn about my favourite 10 crystals. Most of these are not mentioned on other "Top 10 Crystal" lists. Each day we'll explore one crystal, how they are formed, where they are found, their metaphysical properties, and how you can use them in your everyday life. On day 11 I'll include a little bonus for you. Some of the crystals that I discuss include: charoite, moodaite, and seraphinite. There are others, but I don't want to ruin the surprise. You do not need to purchase anything for this course. You do not need to have any of these crystals to do the course. This course is for your information and to give you some alternatives to the main crystals that everyone recommends. All you have to do is sign up for my newsletter. I send out a newsletter every Monday. This ecourse starts on Monday 25th July. If you are reading this after that date, you will receive the first installment in your inbox immediately. If you have any comments or questions, please leave them below and I'll respond as soon as I can. 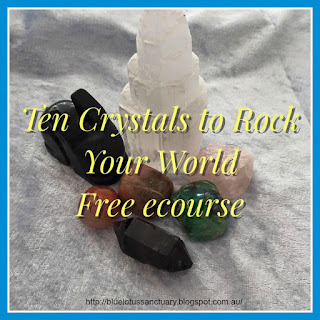 Sign Up to receive your free crystal ecourse! Check out and subscribe to my YouTube channel.